Flashback to Wednesday afternoon. I pulled out my Magnificat to read the Gospel for Sunday before RCIA. The problem was, there were 2 different readings. Are we in Year A or B? I just chalked it up to God just wanting me to listen as it was read during RCIA, only this week we didn't have the Gospel reading and discussion we usually do. I shrugged it off because surely the USCCB will tell me exactly which one to read. Sunday morning I pulled up USCCB on my tablet, but it didn't tell me which one to read. I was a little frustrated. So, I pulled up my email, because my Blessed is She email will have the Readings listed. And it did. I did a little chuckle when I realized That the Gospel tells about the time Jesus went into the temple with a whip, overturning tables and yelling because it had been turned into a marketplace. That pretty much calmed my frustration pretty quickly. I found it interesting that God let me feel so frustrated before reading the Gospel. I know the frustration I felt was just a minuscule fraction of what Jesus felt. The Gospel this week is a story we all know. It's the story about when Jesus gets mad. Honestly, this has always confused me, because Jesus is perfect and, to me, should never get mad. Losing your patience is a sin, right? Looking at it right now, at this moment, I get it. He did what he had to in order to make the people see what they were doing. He had to "overexaggerate" if you will. If he had just walked in the temple and politely said, "Okay, you guys. This is my father's house, and what you're doing is not allowed in here, so pick up your merchandise and get your animals out of here", they would have looked at him and laughed him out of the temple. No, it took something over the top for them to see just how serious this was. During his homily, Father took notice that Jesus drove out the sheep and the oxen; however, he told the ones with the doves to just get them out of there. I can picture Jesus looking at them with compassion and quietly telling them to get the birds out. I never realized the significance of the birds, or that Jesus treated them differently. Father explained that when people came from all over for the Passover, some traveled a great distance. The animal to be sacrificed had to be unblemished, so I imagine that those travelers couldn't chance bringing an animal, only to have something happen to it before the sacrifice. They bought unblemished animals in Jerusalem. The doves were less expensive, so the poor were the ones who purchased them. Therein lies the explanation as to why Jesus gently (in my opinion) told those sellers to take the doves out. And that was my "Aha moment" of the day. Our parish priest is such an amazing homilist. I'm always eager to hear his homilies when I find out he is the celebrant for Mass because I know it's going to be good. They aren't long, but they are short, sweet, and to the point. Not only that but relatable to the here and now. This week's homily was no different. 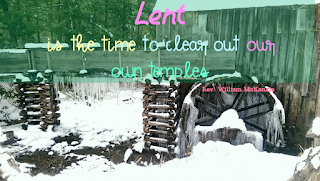 In relating the Gospel to today, he said that Lent is a time of cleaning out your temple. It's now that we refocus on what is important: not the material things or selfishness, but getting right with God. He said, now is the time to "clear out what gets in our way so we can rejoice with a pure heart." We are just about halfway through Lent. Father's words have given me a sense of urgency; I am nowhere near ready to rejoice with a pure heart. I'm getting there. Every time I think I'm on the way I have a setback, but I always seem to get back on the right track. Maybe that's what Lent is all about: the ups and downs, the trials and rejoicing. God definitely doesn't let me too proud of myself! Especially lately, He's keeping me humble! 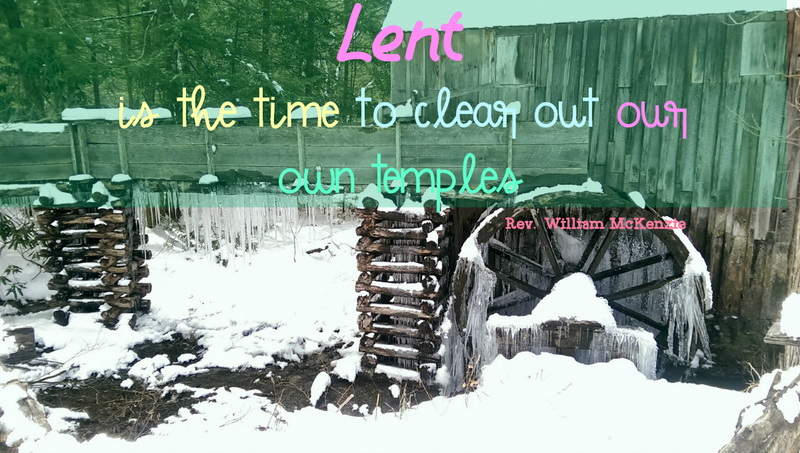 How is Lent going for you? Are you ready to rejoice with a pure heart or are you sensing the urgency as I am? Lent is going fine for us, but we are still at odds with the Pope. Just can't reconcile this.